What better way is there to show your love of all things spooky than in your wardrobe? 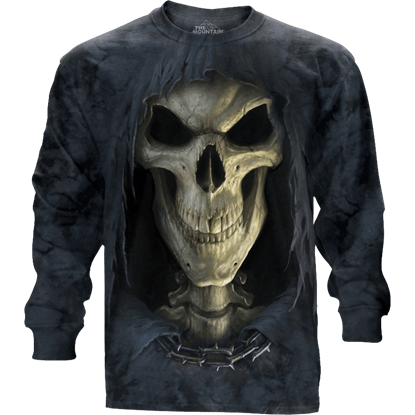 With this Big Face Grim Reaper Long Sleeve T-Shirt, you can easily show off the iconic Angel of Death in a comfy, cozy, and certainly eye-catching way. Make sure that you are prepared to show your love for the Angel of Death at all times of the year, even when it is hot out! 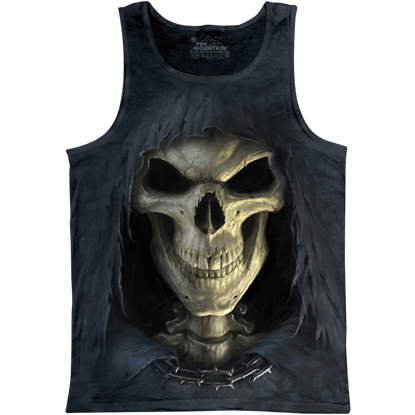 This Big Face Reaper Tank will add just the right sinister touch to your wardrobe of warm weather clothing. Do you like skulls so much that they are a part of your inner self? You do not have to keep your love for skulls on the inside! 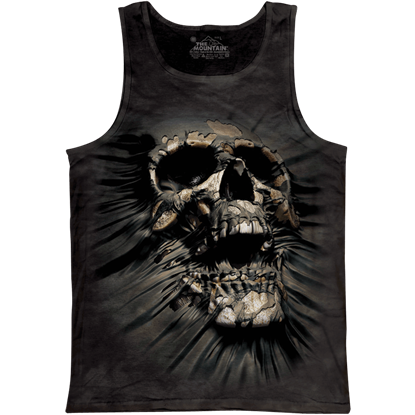 As this Break Through Skull Tank shows, your passion for skulls should be displayed for the world to see. The skeleton is rising from the grave, and he is coming straight for you! 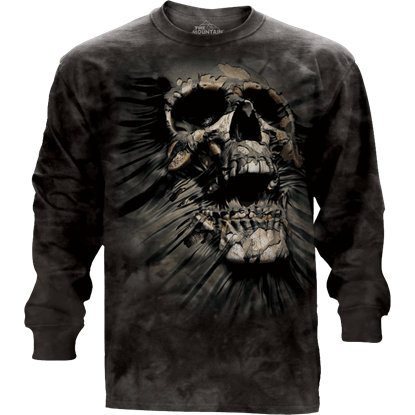 This bold and bone-chilling Breakthrough Skull Long Sleeve T-Shirt features a stunning lifelike image that will be sure to have onlookers running for their lives. Be gone, evil spirit! 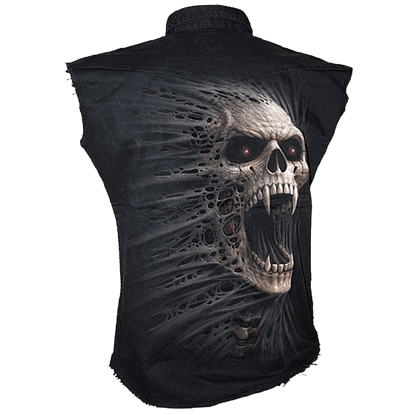 You will look like the recipient of an exorcism when you wear this Cast Out Sleeveless Workshirt, especially when people get a look at you from behind and see the sinister skull as it emerges from the tatters. Are you gambling man? 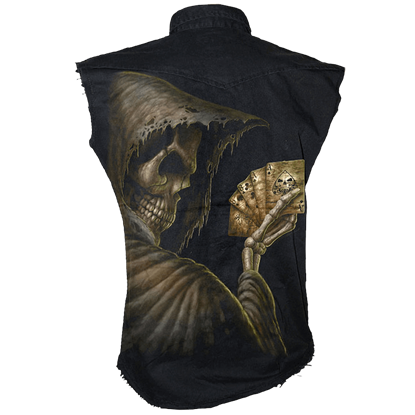 Whether the answer is yes or no, you can bet it all and win, so long as you have on this Dead Mans Hand Mens Workshirt. And not only will you have winning hand, but also stylish gothic garment, too. 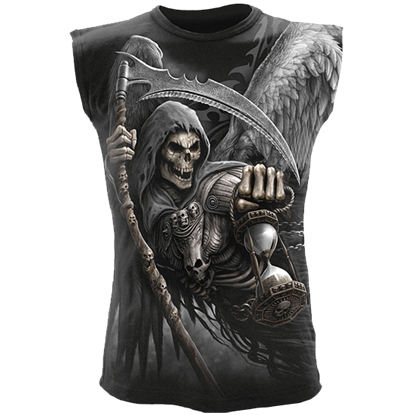 This Death Angel Wrap Sleeveless Shirt gives the iconic grim reaper wings, so that he might fly the skies in search of lost souls, while also creating an impressive and rich gothic design that will be the envy of all who lay eyes on it. From deep within the forgotten catacombs arises a dark presence. 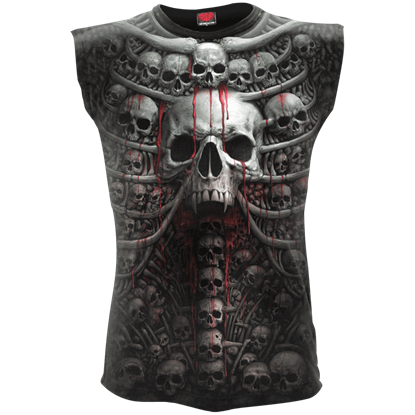 Within its allover, Azo-free graphics, the Death Ribs Sleeveless T-Shirt brings the once stagnant remains of the ancients back to life with impeccable gothic flair. Dragons are immensely strong creatures, whose souls often thought to be alive with raw power. 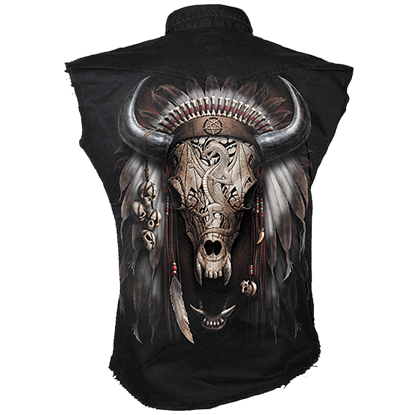 With this Dragon Catcher Sleeveless Workshirt, you can almost harness that power in a tribal artifact that could have belonged to a shaman. Anyone who dares disturb the slumber of the beast risks facing its wrath - the flame, fire, and brimstone of a dragon! 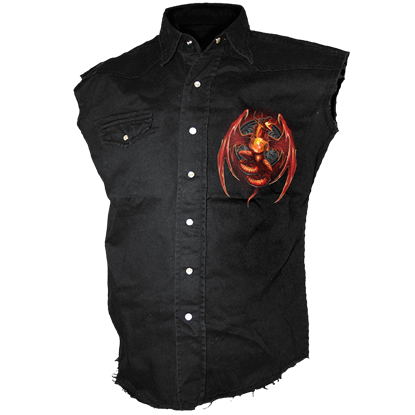 The Dragons Wrath Sleeveless Stonewashed Shirt displays a red dragon as it prepares to breathe out molten death. This garment will give you more than a brief glance at evil. 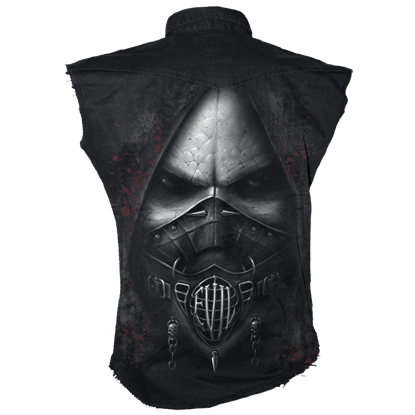 Stunning in its detail, the Evil Sleeveless Mens Work Vest features the pale and sinister visage of a being that is self-described as being one hundred percent evil. Death has come for another victim in the Flaming Death Sleeveless Shirt. 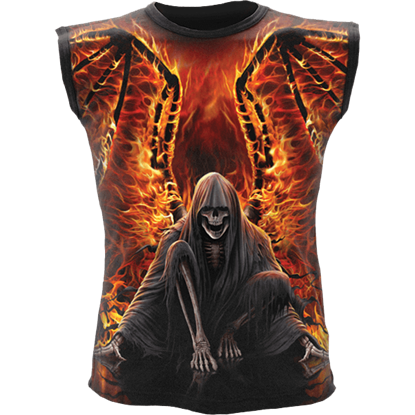 Taking flight on fiery wings, this image of death is printed on a black shirt that is comfortable, durable, and printed using skin friendly dyes.